When Alice Waters was preparing her 2009 New Years Eve menu and needed a certain wild rice to serve her patrons at Chez Panisse, the iconic Berkeley, California restaurant, she turned to AmericanFeast.com, an online gourmet and specialty store that exclusively carries the rice she was looking for — a Native Harvest Wild Rice called Manoomin. Grown naturally on the lakes of Minnesota and hand-harvested by Ojibwe communities on the White Earth Indian Reservation, it’s an heirloom crop that’s indigenous to the area. Deasy’s two year old company is based in New York, however, American Feast’s award-winning farmers, family operations, creative kitchens and small businesses are located across the nation. So, how does this fit in to the 818? American Feast is a one-stop-shop that carries a enormous selection of the some of the most unique gourmet food products found across America — perfect for gifts or your own table. 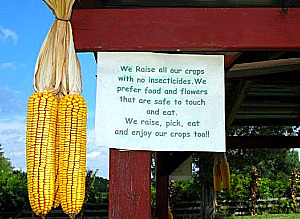 Every product is sustainable and literally comes straight from farms and small businesses to your door. There is no middleman in a warehouse or big producers. American Feast offers sustainable food from the farm and family owned businesses straight to your door. Deasy’s mission is to offer specialty foods indigenous to specific areas as well as to find the best sustainable products offered — meaning food that is grown naturally without genetic enhancements, is cruelty-free, and grown and raised in an environment that is socially kind to its workers. “It’s all about raising, growing and preparing food in a responsible way,” explained Deasy, who added that he finds the suppliers he features by scouring the country, attending food shows and searching the internet to find the best of the best. Cranberry Apple Chutney works as beautifully over poultry as it does a pork loin. Deasy has had a lifelong interest in “good” food, beginning with a love of cooking, his upbringing on eastern Long Island and learning about seasonal cuisine — to working at Paul Prudhomme’s Commander’s Palace in New Orleans, and later on at La Bourgogne in Manhattan, where he learned about French cuisine. Deasy noted how Chef Francois cooked with a conscience by using all animal and plant products without waste. Simply, American Feast is a natural extension of his passion for quality food. 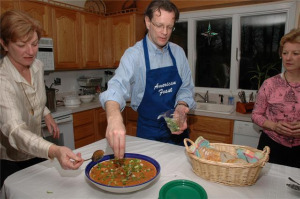 Deasy blogs almost daily on American Feast — about his suppliers, current food and farming news, recipes and anything thing else food or farm related. He provides an education by chronicling food history and tapping into the latest in today’s food marketplace, on top of introducing some of the best food products available. He has wonderfully inspiring stories to tell about his suppliers, many of whom left standard careers to make prosciutto, olive oil, salsas, jams, specialty cheeses and the like. American Feast’s products have a festive feel all year long, but there’s some especially vibrant choices to be had for extra special holiday meals. Here’s a handful, but for the rest go to American Feast for a plethora of gift packs and baskets at a wide range of prices. Cajun Fried Turkey is shipped fully cooked. 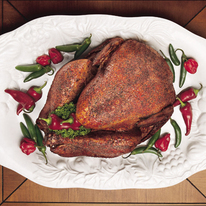 A decadent treat is the fully cooked Cajun Fried Turkey injected with over a quart of ‘Geaux Juice’ (a secret family recipe), which is then hand rubbed with the Cajun Turkey Company’s own blend of Cajun seasonings. After marinating overnight, they deep fry each turkey in peanut oil which seals in the juicy spices. Each Cajun Fried Turkey is wrapped in oven-foil, vacuum sealed, flash frozen, and USDA inspected for wholesomeness (one turkey weighs 10-12 lbs , $54.50). 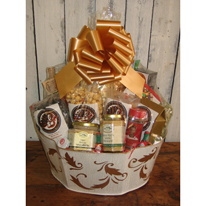 Or check out the gift pack, includes the turkey, assorted chocolates, chocolate chip cookies, chocolate covered pecans, hot ‘n sweet pickles, cheese straws, chocolate covered sunflower seeds, a bottle of hot sauce, dips, mustard, dipping sauce, soup mix and a few more suprises ($134.95). This Free Range Boneless Pheasant Breast is shipped directly from the farm in Wisconsin. If you are looking for another unique poultry selection, but on the lighter side, check out the Free-range, Boneless Pheasant Breast raised at MacFarlance Farm in Janesville, Wisconsin. 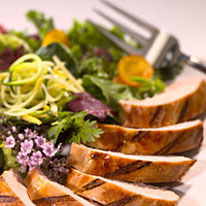 A standard order is four free-range Boneless Breast weighing four to six ounces each ($29 ). They guarantee that it stays moist. 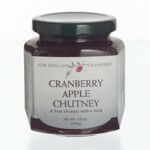 Pair it with Cranberry-Apple Chutney from the New England Cranberry Company (one set of three 12 oz.jars, $17.97 or a gift pack variety of four, $23.96) for an extra special burst of flavor. 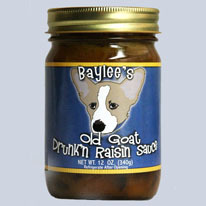 Baylees Old Goat Drunk N' Raisin Sauce is made on a farm in Upstate NY. Or try Baylee’s Drunk and Raisin Sauce from the Szarek’s Farm in Upstate New York — it’s a combination of rum and raisins in a buttery orange base. There’s also Violet’s Medium Fruit Salsa and Vinca’s Sweet Fruit Salsa. If you’re wondering about the names, the Szarek’s products are named after their goats, so the packaging is quite whimsical. It’s a fun gift (a standard order is four 12 oz. jars for $26). Perhaps purchase a selection of sauces and salsas for some mix and match gift giving. 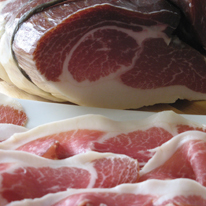 Proscuitto used by Wolfgang Puck at the Academy Awards made the Italian way on an Iowa Farm. A real specialty item is Green Label Organic Proscuitto made by Herb and Kathy Eckhouse’s La Quercia farm in Iowa. It is the first (and only) organic prosciutto commercially available in the USA. They use anti-biotic free pork.Wolfgang Puck selected it to be on the menu of the 2008 Academy Awards (the standard package is six lbs, $200). Or try the Rossa Heirloom Proscuitto, the first and only single breed, dry cured ham made in the U.S. of 100% Berkshire Pork (and selected by Puck for the 2007 Governor’s Ball), three pounds, $54). Olive oil gift set with Persian Lime Olive Oil from Mendocino. Other flavors available. 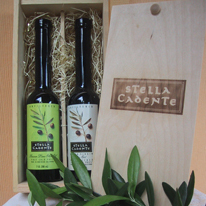 Award-winning olive oils come from the Stella Cadente Olive Oil in Mendocino County where their olives are grown without pesticides or herbicides. They offer such unique flavors as basil, blood orange, meyer lemon, Persian lime and rosemary. Standard orders are two bottles ( $25 -$30) or for a special gift, check out the gift box sets beautifully packaged in small wood crates (two bottles. $25.95 to $35.95. 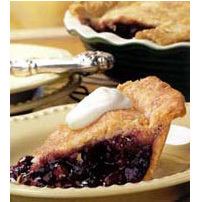 Wild Maine Blueberry Pie is a must for pie lovers. If you are a pie lover, not to be missed is Maine’s Wild Blueberry 10-inch Pie — filled with the uniquely small berries only associated with those that grow freely. It’s shipped frozen and ready to be baked upon arrival — or put it in your freezer for a special occasion ($25). 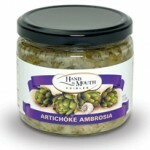 Artichoke Ambrosia is a delicious tapenade appetizer made in the 310. A wonderful spread made nearby (in the 310!) is the Artichoke Ambrosia tapenade by Hand to Mouth Edibles. Use it as an appetizer, condiment or add it to a gift basket (standard order three 7 oz jars, $18). A great gift selection is Artichoke Ambrosia, Greek Caviar, Roasted Red Pepper Rhapsody, Tantalizing Tapas. A portion of their profits benefit Share Our Strength – a national non-profit organization working to alleviate hunger & poverty. 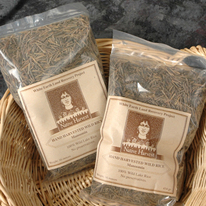 Native American Wild Rice is grown and gathered on Indian reservations. Great feature and great website! Where’s my Christmas shopping list? This is so womderful..saying thanks just doesn’t seem to do! Jeff Deasey has worked so hard to make American Feast the outstanding company it is. This article so such a fine job of presenting this effort in the light it deserves. I am proud to be a part of this fine effort! Back to the Kitchen: Oooh La La Fondue!